Daredevil Felix Baumgartner had the Internet on smash Sunday with his daring free fall from 128,000 feet above the Earth. Red Bull sponsored the event, tagged it "Red Bull Stratos," and provided a live stream of the leap from the stratosphere on YouTube. Baumgartner's jump broke numerous records. The jump now holds the record of the highest-ever jump from a manned balloon. All Things D reported: "The previous record for a single Web video service: Around 500,000 concurrent streams, which Google served up during the Olympics this summer." 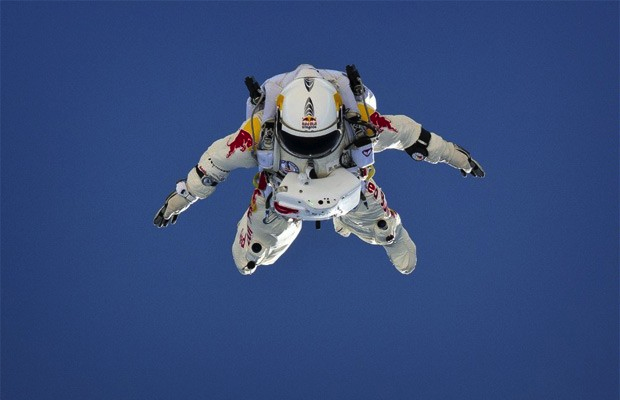 The live stream of Red Bull Stratos shattered that record bringing in over 8 million viewers on YouTube. The record breaking does not stop there, the initial goal of the leap, for a human to break the sound barrier was reached with Baumgartner hitting 833.9 miles per hour. Sound travels at 761.207 miles per hour.